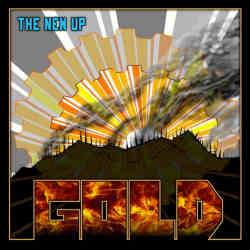 The New Up from San Francisco started in 2008 and have released an EP every year since then. Even though their third record Gold is over forty minutes long, the band doesn’t consider it a full album. Stylistically they move between indie rock and alternative pop but is also not afraid to venture into different territories. Main influences are Garbage and Franz Ferdinand, making it no surprise they The New Up are toying with trends that were fashionable at the turn of the millennium. Sometimes this works really well, other times alas not so. The opener Gold wins over the audience with the strong female vocalist and a good ear for catchy melodies. The following Daydream adds a male voice. Tiz Da Season and Better off show the band from their more daring side where they lavishly mistreat their instruments and even achieve a certain psychedelic mood. See Yourself manages to please thanks to some progressive parts. Unfortunately the EP also contains three weaker track that can’t quite keep up with their better material. The New Up keep their music in the background as they put the major emphasis on the vocals, and it’s on those three tracks where the singer nearly sounds bored. All is not gold that glitters, and not everything on Gold is able to shine. The EP certainly contains some pleasant moments but is unable to offer anything substantially new. If the band is able to work on that problem and furthermore will eliminate their weak spots, I am sure that their next EP can score a higher grade.